Drip Tape, 500' - is a flat, thin walled hose containing pre-spaced drip emitters that expands when filled with water. Features:â€¢Ideal for use on rows of vegetables or fruits, such as blueberries, strawberries, cucumbers, melons, raspberries, and many more. Drip Tape is a flat, thin walled hose containing pre-spaced drip emitters that expands when filled with water. The drip tape has in-line drip emitters, welded into to the drip tape every 12" during the extrusion process, allowing for complete saturation coverage along the line. 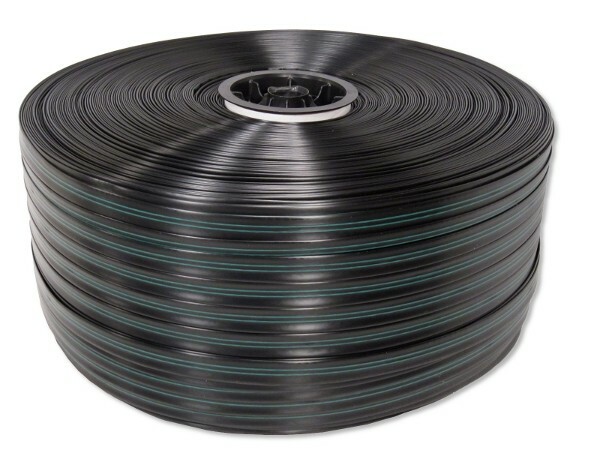 Ideal for drip irrigation of vegetable gardens and row crops including tomatoes, strawberries, melons, peppers, eggplants, and more, drip tape can be installed above or below ground or under mulch. The most efficient use of drip soaker tape is with low flow drip emitters, closely spaced to achieve the desired wetting pattern. Homeowners are successfully using a range of drip irrigation techniques including drip tape systems to grow a variety of crops without the use of traditional sprinkler systems. The drip tape requires special fittings, available in a number of configurations, for exclusive use with the drip soaker tape.